After leaving Wicked Weed we took the short walk (0.3 mi) over to Green Man Brewing. Named after a figure from Celtic folklore, Green Man was recommended to me by my friend Mark Richards. 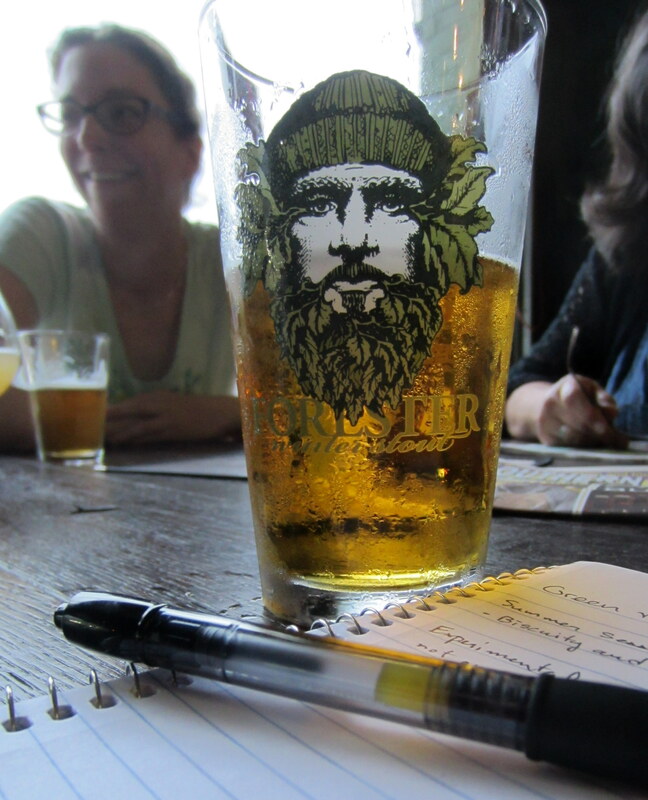 They have been in business since 1997, which makes them one of the older breweries in Asheville. They distribute throughout North Carolina as well as to parts of South Carolina and Tennessee, which makes them more widely accessible than many of the breweries I visited. 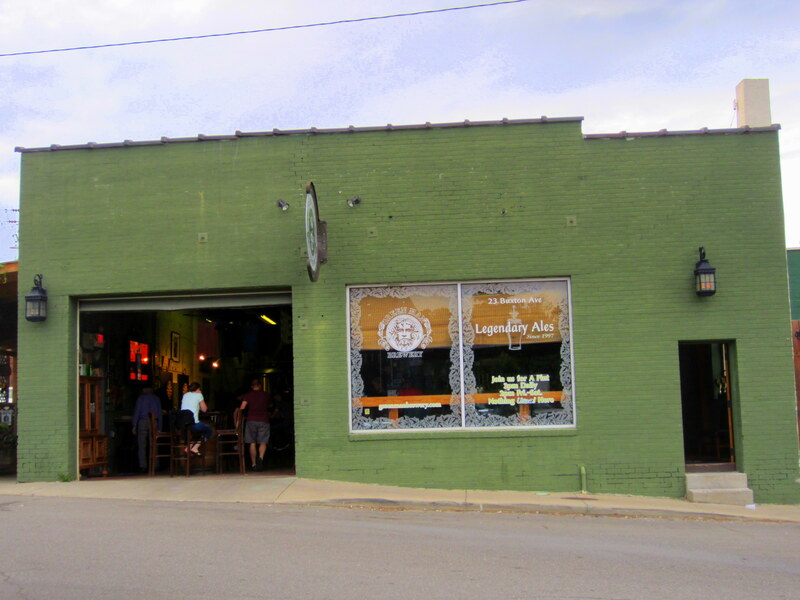 The taproom is located in a relatively small, unassuming green brick building. The décor is eclectic, chaotic and prominently features more green humanoid figures than any taproom in the Western Hemisphere, including Yoda, Gumby, and a couple of creepy looking green zombie babies. 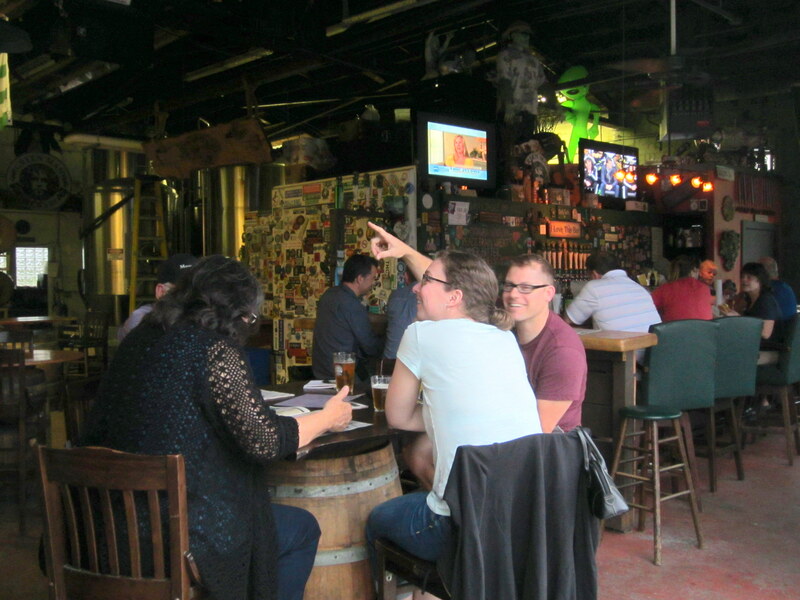 The brewery spills over into the tap room without a clear distinction between the two. There is a outdoor patio on the side of the building and a food truck was parked out back the night we visited. Both kids and dogs (on a leash) are welcome. I’m fond of casual taprooms and Green Man nails that vibe. This is the kind of place that is perfect for meeting up with a few friends for a casual pint and some good conversation. There were approximately 10 beers on tap, with a selection that leans toward English-style ales. Unlike many of the places we visited they did not sell flights. My companions Michelle and Andy lived in Liverpool for three years and miss the British ales, so Michelle was keen to try the Summer Session Bitter on cask. Unfortunately the beer was a letdown, biscuity without much in the way of fruitiness or other redeeming flavor contributions from the hops, and lukewarm (even for a cask ale). I had a pint of a pale ale made with an experimental hop strain. There was nothing wrong with the beer but compared to the beers we had at Wicked Weed it did not stand out. Andy had the Berliner Weiss, which was definitely the best of the three—very tart, lots of fruity lemon character, and low abv (3.4%). It was spot on for the style. They also had a Flanders Oud Bruin on tap that piqued my curiousity, but we didn’t have a chance to try it. Green Man tap room and brewery from the front. Cool, laid back atmosphere, but quite frankly 2 of the 3 the beers we tried were unexceptional. Maybe we didn’t make the right choices, but based on that limited sampling I’d have to put their beer firmly in the bottom half of the places I visited. After visiting I did do a check of their beers on RateBeer.com and those ratings suggest my opinion is not atypical. Nonetheless, its proximity to other breweries and the casual atmosphere makes it worth stopping in for a pint. If you go I’d recommend one of their sours.